There’s been a break in at the bank and a crook is trying to steal some money! Put the buildable police van together and rush to the scene. Catch the crook in the act and lock him up in the back of the van. There’s no way he can escape now! The Police Patrol (10809) Lego set is available from the sites below. However, they do not offer delivery to your selected region. 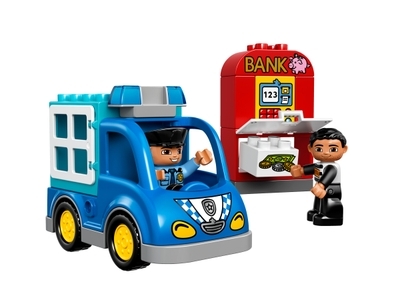 The Police Patrol (10809) Lego set is no longer directly available from the sites below. However, 3rd party partners of these sites might still have the set available. Alternate description Speed off in the police van to catch the crook at the bank. Lock him up in the back of the van and make sure he can’t escape!